My first attempt to teach the Read and React offense pretty much failed. The guys did fine with it in practice, but tended to abandon it in the heat of real games. The next time I taught Read and React, I tried a different layer order (teaching the passing layers first), and I worked harder to sell the offense to the players, and that really worked for us. However, the third time I taught a team read and react, I really strayed from the beaten path and taught it in a totally new way, a way which I’m about to share here in five parts. I’m sure many of you will absolutely hate this new approach, but frankly, it was dramatically more effective — so much so that I plan on using this approach again, refining it as I go. In fact, I’m posting it here in the hopes that you guys will help me refine it, or at least tell me why I should go back to a more conventional way of teaching it. For reference, Rick Torbett has invented a smart half court offense called “Read and React,” and he teaches it in what he calls “layers.” I like the offense, but the layer approach of teaching, while simplifying individual concepts, complicates the overall understanding of the offense, I think. Rather than teach and drill the Read and React offense a “layer at a time,” I reorganized the Read and React principles into 4 logical, intuitive groups, and taught and drilled each group at once. This approach made Read and React easier to grasp, faster to learn, and much more natural and effective in its execution in half court basketball for at least 2 groups of teenage boys. As most of you know, in the world of technology, “RGB” stands for “red, green, blue,” and everything we see on a television, computer screen, smart phone, etc. is all just a blending of these three fundamental colors. It really is amazing when you think about it: everything we see on these screens is really just a matter of how the device uses red, green and blue. It doesn’t matter what half court offense you talk about, from the Triangle (Triple-post) Offense, to the Read and React offense, to a library of set plays, to freelance playing… all half court basketball is just a matter of how a team uses spacing, ball movement and player movement to score the ball. The funny thing is that as obvious as this is, I have yet to meet a coach or a player who even understands that all his favorite half court offensive strategy and set plays are all just how these three things are being applied to create scoring opportunities. 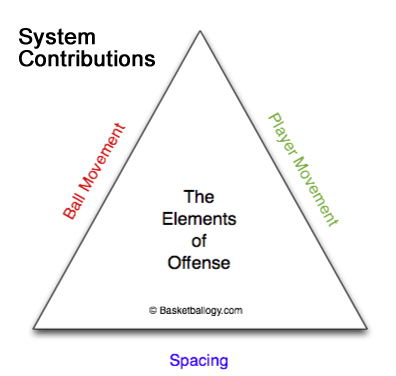 Anyway, like all half court offenses, the Read and React offensive principles can be grouped into these 3 fundamental elements of half court offense, and by teaching them in these groupings, players grasp the R&R Offense’s principles very quickly. And because they instantly see how the R&R principles apply to their half court play, they quickly adapt them into real basketball playing. Each phase has its own set of rules, and the reasons behind them. I feel it is critical that each player doesn’t just understand the rules of the offense, but the reasons for each of the rules as well. Teaching players why they should do certain things on the floor makes a world of difference in how well they do them. After all, it is one thing to tell a kid to climb a mountain, and another thing altogether to tell a kid to climb a mountain because a giant tsunami is coming. The “why to do” something has such an affect on the “what to do” that I feel we can’t just teach players what to do and send them out there like robots who will obediently execute what they’ve been taught (and if they don’t will once we yell at them to). I feel players play better when they know the reasons for doing what we do on a basketball court. After all, no matter how good our offensive system is at creating great shots, it can’t make them for you. Ultimately, players play the game, not coaches. True, these things can be coached to a degree. We can use our knowledge to teach players better decision making, our influence to get great effort from our players, and our authority to get the right capabilities on the floor, but none of that is actually playing the game. Ultimately acumen, effort and capability are player contributions. 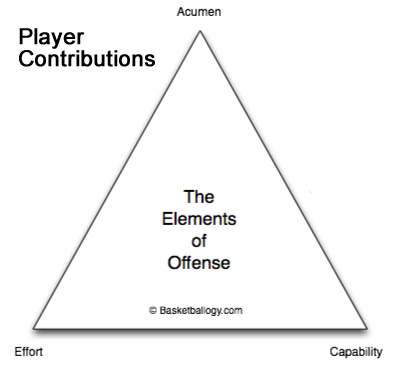 (For more on the Elements of Offense, check out my article: The Elements of Offense: How to actualize a good halfcourt offense). I was very interested in what you had to say… I have been studying Read & React to use in this coming year with my high school team. I stumbled on this on the internet looking for more info concerning the Open Post Offense which we uses with some success. I am thinking of using this the Read & React to Build our Program. Kids now a day simply don’t just play in their back yards or at the locate court they won’t play unless they are coached. Plus when you try to put in different approaches to different zones, etc. they can’t remember or look at you as if they are deer in headlights. How about zone defenses have you used the Hook & Look Read & React ? Sorry for the delay in writing this series. I had a son get married then an extended illness and didn’t have the time I thought I’d have. However, now that both are behind me, I’ll get this series going again. Thank you for your comments. BTW, I can appreciate your comments about zone adjustments and “hook and look.” I think you are going to like what we’ve done to make it easier for young players to do the right things against different defenses. I’m really looking forward to reading upcoming articles in this series. Thanks for letting me know. I’ll try to get this series bumped up higher on my priority list. Hope to see more of your articles soon Tom. I’ve been teaching my team read and react and came to a similar way of thinking – teach passing or dribbling or cutting as a group. The girls picked up the concepts better. Torbett would probably suggest this is just a way to focus players on their skills and I’d agree. By teaching all, say, the passing drills first we’ve been able to step the players through to a much higher level quicker. If you’re limited to 1 training session a week the way we are, it makes more sense to do it this way. Hey Tom…You got my ears open…can’t wait for the second part!!! Please publish parts 2 through 5. Very interested in how you teach R&R. The youngest boys and girls I have coached are 12 years old, but I would think that the R&R would be perfect for your daughter’s 5th grade select team. I’ll try to get my articles out soon, because my experience with this approach has me believing it makes the offense simpler and more intuitive for young players, and therefore takes less practices to get the team functioning with it. I enjoyed reading your insight! I can’t wait for parts 3 -5 to come out because you have had several different experiences implementing this offense. Love the article. I enjoy the Read and React too. I like how they organized everything. To me, it’s just a different way to organize motion offense principles that is easy to teach. Nothing is new, except the way the principles are organized. This is not a knock whatsoever. Actually, genius on BB’s part. Your RGB offense sounds like you are just taking motion principles and creating your own offense. That’s what I do, I take a little bit from everybody and organize my offense a certain way. Guys, FYI, I just posted part 3. I’m sorry again for how long it took me, but it was so wordy I decided to delete large chunks of it and replace the words with some graphics. I started teaching R&R to my club team 3 years ago when the girls were in 5th grade. It’s been fun watching them grow as players through the system. I am always praised on how well the team plays. We have won many leagues and tournaments and our ball movement and player movement is far advanced to most of our opponents. After watching many local high school games, I have no doubt that our team could play competitively with many of those teams.